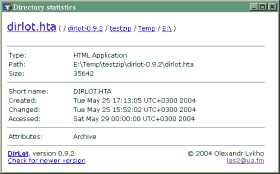 The DirLot utility shows relative size of files and subfolders in a folder on diagram. 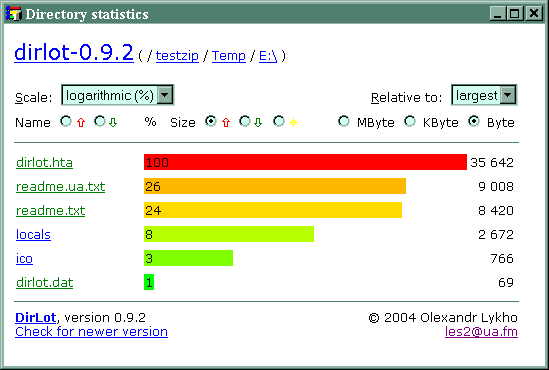 In other words, this utility allows you to quickly estimate how many space a file or subfolder occupies in a folder, or how total size of the folder is distributed among its elements. Thus, the utility helps you to analyze how space is distributed on your disk and determine which folders or files take the most of disk space. Presenting relative sizes of files and folders on vivid colorful diagram it greatly increases both speed and efficiency of disk space management eluding guess-work or repetitive manual queries of file system. proceed to get some more explanations. 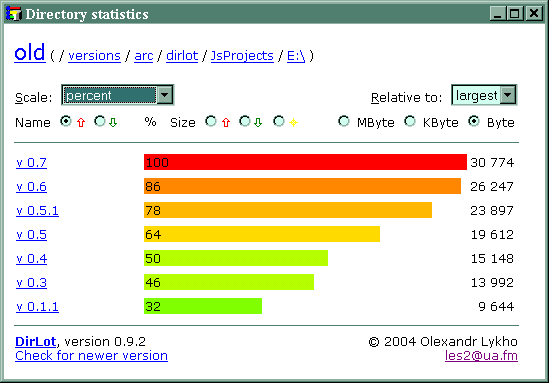 The screenshot of the utility (to the right) will help you to catch the point. Full 'inverse' path to the current folder is displayed at the top of the utility. The several controls below allows you to change visual presentation of the size diagram. Here is the table under them, whose left column lists names of subfolders and the right column shows diagram strips and size of appropriate subfolder. If you want to analyze another folder, just click on the corresponding link in the left column or in the 'inverse' path at the top. In order to update current view click on the first (leftmost) element in the 'inverse' path. If the folder contains files too, then the file links are indicated with green. 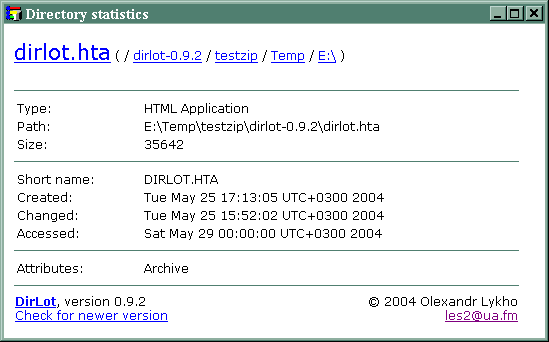 Once you select such link, Dirlot will show you the metadata of corresponding file instead of diagram - file's attributes, creation date, etc. When Dirlot shows metadata of a file it looks like it is shown to the right screenshot. At the bottom of utility's window is placed its version number, link to the page and email of its author (for your complaints and suggestions). Finally, when it retrieves data about sizes of elements in a root directory, it displays progress indicator (since the process can be sometimes long enough, taking up to a few dozens of second). If the utility is of your interest then even if it's seems all clear for you, refer please to the page System requirements. If you want to inform author about something, please don't hesitate whether to write. You can download the utility from the Download page. the way of sorting contol is changed - in the Adam's modification you can change sorting order by clicking on size table header columns. First click - ascending order, second one - descending, and still one restores original sorting. Easy. 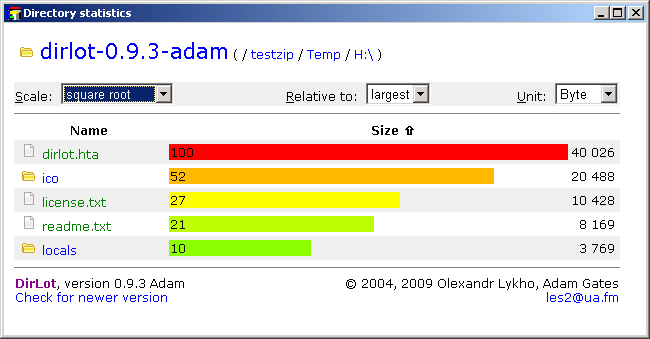 adjasent rows in the size table are marked with slightly different color - so it is easier to identify whith strips corresponds to which file or folder. some little icons added for files, folders and disks (partitions) - just more visual sugar and looks more customary. Minimum coding was required to accoplish all that. The only trouble author had that not allowed him to put the modification for download right away was the old license. He changed it and now you can download the modification. So Dirlot is open source and it means you can change it too. Try. It should not be hard. And do not forget to send your modifications back to author. Have fun. "One program which is striking both for the kinds of results it returns and the way it's been implemented is DirLot, a compiled HTML application that returns a colorful and interactively explorable folder-size report. The program is designed to tell you what in a given directory is taking up the most space by percentile, but it also returns the total size of a given folder quite quickly, and it tries to inform the user when it's busy harvesting information so you're not faced with an inactive display when you click on something." In any case, you can find such an utilities in many software download directories in these sections Disk Utility, File Management.